Capricorns are the 10th astrological sign in the zodiac. They are represented by an image of a goat, a symbol based on the Sumerians primordial god of wisdom and waters they called Enki. This creature actually had the head and upper body of a mountain goat, and the lower body of a fish. 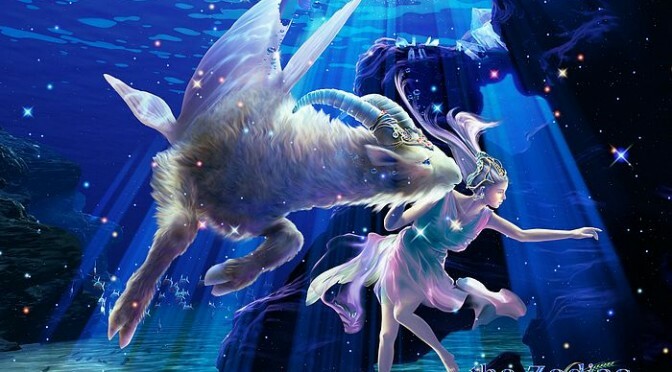 The goat aspect of this creature represents curiosity, steadiness and determination. The fish aspect represents intuition, emotional connection and spirituality. This sign is very complex and has many different facets to it. Ruled by Saturn, the planet of discipline, responsibility and structure, many Capricorns take on these traits naturally. Capricorns have a lot of self control, intelligence and sometimes quite good manners. An Earth sign, Capricorns are practical, patient and naturally hardworking. Capricorns can make great parents, leaders or people in powerful positions because of their level of dedication. Many Capricorns find success in business because of the nature of its work – they don’t mind taking on a constant challenge. The interesting part of this sign is that the symbol that represents it is made up of multiple animals. Capricorns are very dynamic people who can be more dominant in either the goat or fish aspect of their sign. The goat can be represented by male energy – it’s direct, assertive and to the point. The female aspect is represented by the fish. The fluidity of emotions is the waters that this fish swims in – this aspect is sensitive, emotional and intuitive. The lesson many Capricorns are learning is how to balance these two energies. This can look like how you hold yourself, your tone of voice and perspective on situations. It’s all about feeling the energy of the people you’re interacting with. When you feel you need to shift into being softer or having more female energy; that can be as simple as being more nurturing, soft and understanding. Shifting into male can look like being more assertive when its necessary to stand your ground or speaking up when you need to. Many Capricorns are known to be very stable in their lives both finically, emotionally and mentally. They are able to make a place for them in this world when others find it nearly impossible. Capricorns make great friends, they are open, honest, humorous and intelligent in their being. They don’t typically have a large circle of friends, they usually choose a close few to spend their time with. Many say Capricorns don’t hesitate to spend some money to have a fun night with their friends. Does this sound like you?